RJ-11 phone connector with female socket. RJ11 is a type of 4-pin connector of the Registered Jack family, normally used with twisted-pair copper wire, which is the industry standard for 1- or 2-line analog (Plain Old Telephone Service) telephone connections; it will mate with the center of an RJ45 connector. 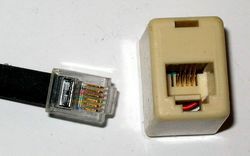 In the United States, RJ11 connections became available in the 1970's for use inside homes for connecting telephone sets to telephone wires via RJ11 jacks. Prior to their introduction, the wired connection of a house phone to the telephone system typically required a user to unscrew a proprietary plastic covering from a proprietary plastic jack. Inside were terminals whose connections were not explained to ordinary folks, making it unlikely that most people could move a phone from one place inside their house to another place without intervention from the telephone service provider. Further, the phone companies often considered it a violation of service terms for a consumer to attempt to move a telephone jack or alter phone wiring in any way. This page was last modified 04:04, 8 July 2011.